This weekly radio show features host and Sotheby’s International Realty’s Associate Broker Rey Post (NM REC License #45660) and a variety of special guests offering the best news, information and commentary regarding every aspect of today’s real estate market. In the first hour of the show, join Rey and his guests for a program inspired by an historic event that occurred exactly 134 years ago this Sunday. On October 14, 1884, George Eastman received a patent on his new paper-strip photographic film. The man and his company (Eastman Kodak) changed the way that photography played a role in the lives of people all over the world. Real Estate Brokers Help To Make Buyer/Seller Transactions “Picture Perfect”: Rey will offer some thoughts on how real estate professionals bring their expertise to make all of the elements to home buying and selling, as perfect as possible. Rey will also offer his weekly “Rey’s Real Estate Recommendation,” which is designed to make the home buying and selling process a bit easier and more enjoyable for consumers. ShowHouse Santa Fe: Interior designers Heather French and Larry Wilson, participants in the highly successful ShowHouse Santa Fe 2018 event, will join Rey to offer information on this year’s gathering. Starting during the October 6-7 weekend, this popular public event continues on October 13-14. Fifteen of Santa Fe’s most uniquely talented interior designers and decorators have collectively transformed a luxury Santa Fe residence into an interior design experience. This year’s event will feature the unique concept of designers pairing up with local artistic chefs of the region, inventing a fresh global experience for “a world of taste.” ShowHouse Santa Fe 2018 co-founders Jennifer Ashton and David Naylor note that since this unique event began six years ago, nearly $140,000 has been raised in support of Dollars4Schools, providing funding to Santa Fe public school teachers; supporting over 250 classroom programs in 29 Santa Fe schools; and enriching the lives of thousands of Santa Fe students. For event details and ticket information go to: https://www.showhousesantafe.com/tickets/. The Club at Las Campanas Report: Rey will offer some observations on the important role that The Club at Las Campanas plays in the community, including a review of the amenities The Club offers to its members; the activities The Club is pursuing at this point in 2018; as well as the range of unique events it has and will continue to showcase throughout the rest of the year. This includes a series of special lectures and presentations of renowned business leaders, music performers and authors, The Club is known for offering an extraordinary setting to enjoy an ideal life in Santa Fe. As one of the nation’s most regarded country club destinations, The Club was not only recognized as a Platinum Club of America for 2014 – 2016, it is also known for its deep commitment to the people and environment, as well as programs that help to make Santa Fe a better community. The Club’s amenities include two championship Jack Nicklaus Signature Golf Courses; a well-equipped fitness center; tennis and spa facility with seven synthetic clay courts; one of the finest equestrian facilities in the Southwest; and, the casual and fine dining provided at The Club’s Hacienda Clubhouse. Rey’s “Real Estate Recommendation”: As has been the case for the past two weeks, Rey’s weekly real estate recommendation offers some specific thoughts on the importance of voting during this year’s mid-term elections. Early, as well as absentee voting are options to pursue for New Mexican residents who are registered to vote. 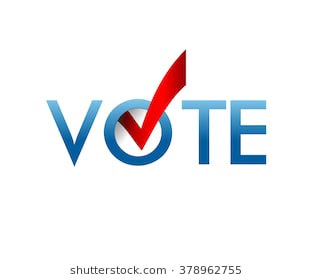 In addition, there is always the choice of voting on election day, Tuesday, November 6. Participating in the electoral process is the most direct way for home owners to have influence on who serves in local, state and Federal government positions. Open House of the Week: Rey will review the attributes of 2551 Tano Compound, with his Sotheby’s International Realty broker colleague Ashley Margetson. This four-bedroom and one owner home, is custom built and is located in a superb eight-home paved gated compound on Tano Road, just minutes to downtown Santa Fe. The house has no interior steps, is nestled on 2.29 lush wooded acres, offers numerous features and has a brand-new roof with a lifetime warranty. In the second hour of the show, join Rey and his guest co-host Craig Hoopes, Principal at the highly-regarded firm Hoopes & Associates Architects, as they continue to discuss the theme from the first hour of the show. Specifically, Craig will offer his thoughts on all of the ways that he and the members of his firm work hard to make his client transactions and experiences as “picture perfect” as possible. Among many other examples, Craig’s architectural firm has accomplished this goal by designing and then assisting in the building of the Grand Hacienda-winning home of both the 2014 and 2018 “Haciendas, A Parade of Homes” tours. As participants in these editions of the nationally-known and highly-respected event—sponsored by the Santa Fe Area Home Builders Association—Craig and his team joined home builders, landscape architects, and interior designers in the design and construction of these award-winning properties. With this history as a backdrop, Rey and Craig will also discuss current architectural issues that are impacting the home building process at this point in 2018. During the second hour of the show, Rey will also feature another interview with professional interior designers associated with this year’s staging of ShowHouse Santa Fe 2018. Giving Back: The Realogy Disaster Relief Fund has been activated to provide much-needed financial assistance to help those who were affected in September 2018 by Hurricane Florence and are in need and not covered by personal insurance policies. Those affected by Hurricane Florence and covered by the Fund’s program can pay for emergency-related costs such as significant home repairs from flooding, lost possessions, and temporary housing expenses. You have the opportunity to donate to the Fund, with 100 percent of all money received being disbursed to those in need. The Fund is managed through the Realogy Charitable Foundation, which is matching up to $50,000 in donations for this hurricane relief campaign. Click here to donate to the Realogy Disaster Relief Fund for Hurricane Florence. Realogy Holdings Corp. delivers its real estate services through its well known industry brands including Sotheby’s International Realty®. Since 2009, the “All Things Real Estate” (ATRE) radio show has donated air time to a variety of Santa Fe non-profit and community organizations. Representatives from organizations are able to use the ATRE program to share news and information with northern New Mexico residents about their services and activities. In 2018 alone, some of the organizations featured on ATRE in donated air time are: Kitchen Angels; Creative Santa Fe; Presbyterian Santa Fe Medical Center; Dollars4Schools; and, the New Mexico Real Estate Commission. In addition, Santa Fe Mayor Alan Webber has been a guest on the show on multiple occasions in 2018 sharing useful information about city programs, events and community activities. This entry was posted in Real Estate News & Resources on October 11, 2018 by radio. In an article published in the Atlantic, a question was asked that has great bearing on us, as we approach the mid-term elections on November 6. Specifically, the author asked: “Which constitutional right is the most important? You might answer “freedom of speech” or “free exercise” of religion. Some think it’s “the right to keep and bear arms.” Criminal lawyers think of the guarantee against “unreasonable searches and seizures,” trial lawyers of jury trial in civil cases. In another article penned exactly two years ago by meditation teacher and author, Sharon Salzberg, I found that her description about the circumstances surrounding the 2016 Presidential election, was ironically similar to the state we find ourselves in today. “This election cycle has struck many of us as particularly intense—from public interactions between the candidates and their party officials, to the mutual attacks by voters on each other that can be found all over social media. Voter-behavior seems to also be topic that the media has been covering with more focus these days. And while much of it’s noise, the stories that have resonated most with me have been those about people who aren’t planning on voting. This is a cause I care a lot about, in a very deep way. I try my best to make a distinction between the feelings of anger and anxiety that can easily come up during election season, and the act of self-affirmation that is voting itself. As a meditation teacher, I not only feel compelled to vote, but to emphasize the imperative to vote. It may seem strange to relate spirituality and voting, especially in a country where religion becomes the source of policy-related conflict during political debates. But the faith that I think about in the context of voting is completely non-partisan. It’s about recognizing voting as an immense form of freedom we’re given; we have the choice to participate in the outcome of our lives, the lives of others, and the country as a whole. Each of our influences on any outcome may be incremental, but it exists, and is a critical component of change. In that way, each one of our choices to step up and take action has immense impact—on each other, and on our world’s future. Many years ago, during an election cycle, an acquaintance said to me, “The differences between candidates tend to feel so marginal.” I can’t even quite remember who she was talking about. But regardless of specifics, I think it’s critical to recognize even the smallest margins of difference in the choices we make—in an election, or any time. In this case, one candidate’s views on education may not be a high-stakes issue for you, but they may greatly affect another person (likely millions of people). All of us, millions of us, are greatly affecting each other each day. By voting, we honor that connection. I’m told that in Australia, all citizens are registered to vote and actually pay a fine if they don’t vote. I like this model, though given the choice we have here, we actually have an invitation to pay attention to voting as a privilege, rather than a chore. So “Rey’s Real Estate Recommendation”—for the weeks leading up to the November election—is to remember this constitutionally granted right that each of us as registered voters possess, is to be treated as a great honor we as residents of this nation. Please take the time to cast your own ballot on November 6. I also want to remind you that a place for you to learn about home buying and selling elements, is to join us each Sunday on the “All Things Real Estate” radio show at 12-2pm Mountain Time. Also, if you go to my website, you can send me your own real estate questions, or suggestions for topics that he will handle on the program (that’s ATREradio.com). I will treat your questions confidentially and will send you answers I hope will help you in your own real estate activities. This entry was posted in Real Estate News & Resources on October 7, 2018 by radio.